A wonderful private 3 bedrooms bungalow villa (2 double and one twin), 2 bathrooms, fully air conditioned throughout, fitted kitchen, coffee maker, juicer, large fridge and freezer. Ideal for families as located on small quiet cul-de-sac; there is a travel cot and child car seat if needed. It has laundry room with washing machine. Internet access and Wi-Fi - Sitting/diner with Internet TV (all the English channels, sports, movies etc), DVD, video, Hi-Fi with library of films and music. Outdoor loungers, table and chairs; gas BBQ for dining alfresco. Garden shed with lilos, pool toys etc. Wonderful heated pool (not overlooked) with easy access steps. Beautiful fragrant garden with automatic watering, lemons all year round. Hello, We are now grandparents - we bought our Cyprus property in 2003 - still have it and love it. We let it out during the season for a few weeks to help recover some of the running costs. It is not run as a business but is a little bolt hole for us to escape - we hope you will enjoy your stay and take care to look after the villa as if it was your own - thank you. The photo above was after completing our 10k run along the Akamas for Cancer Relief. If you enjoy sports there are lots of really good, friendly and welcoming fitness centres locally - and the Paphos running club hold twice weekly jogs, and runs for all levels most of the year. It is quiet, peaceful and not overlooked. It is rural but not too far for us to walk to restaurants, down to the beach (20mins). We can go for a walk, run, swim in the pool or just relax and the people who look after the villa for us are great. Large fragrant garden with lemons (almost all year round) and oranges in season. Private secluded pool. Good free Wi-Fi. On small quiet cul-de-sac so little noise from passing cars. No tumble drier but there is a rotary drier for the garden which just slots in. cooker, hob, extractor, large fridge, large freezer, microwave, coffee percolator, juicer, toaster, twin sinks. Yes! there is skiing in Cyprus (see picture) - right on top of Mt Olympus. A few short runs and you can normally ski into March (very weather dependent but better than a dip in the sea in February). Notes on accommodation: A Cot is available for babies and a car seat if required. All rooms have air-conditioning units some also have ceiling fan. Solar powered hot water system with high pressure pump. All bedrooms have fully fitted wardrobes, dressing table and chair, bedside table and lights. All windows and patio doors have louvered shutters and fly screens. There is a safe for valuables. Outside: The garden is large, beautiful and fragrant with Palm, olive, citrus (lemons most of the year) and oranges (Jan - April), a rose garden, flowering shrubs and borders all with automatic watering. Utility Room: Washing machine, clothes airer and pegs for outside drying. Cleaning / Towels / Linen / Maid service: Linen, towels provided (not beach towels) and tea towels - clean set of bed linen and towels provided weekly. Maintenance and service staff live locally (5 mins away). 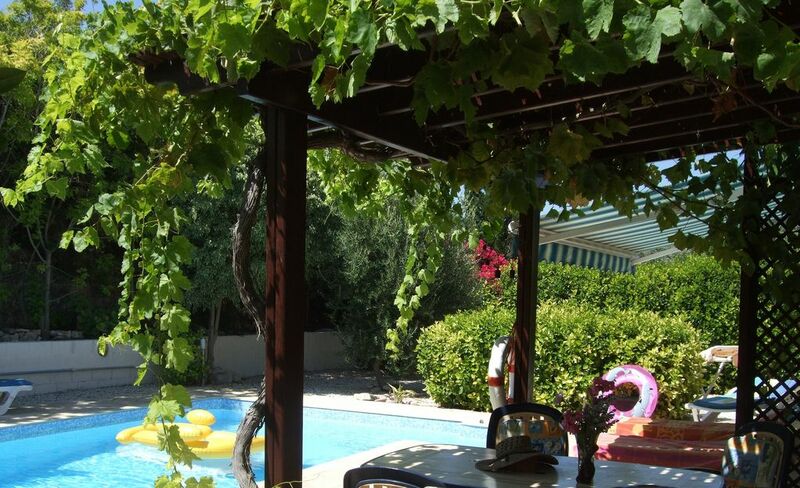 As regular visitors to Cyprus we know exactly what we want from a villa holiday...we've stayed in villas many many times over the last 20 years and I have to say that Pilgrims ticks all the boxes!! The villa is tucked away in a quiet cul-de-sac and is private and secluded. The pool is a gem, with sparkling, clear water and is perfectly maintained. As I said, we are no strangers to Cyprus nor to Coral Bay and Paphos in particular, so don't feel the need to be out and about every day so spent a lot of our holiday just chilling out at Pilgrims. It is very comfortable and welcoming, complete with everything that you need to make you feel at home and the UK TV service is far superior to anything that we have experienced in the past if this is something that is important to you! All in all this was one of the best villa holidays we have ever spent in Cyprus and we came home feeling rested and relaxed. We definitely hope to be staying here again!! Beautiful, surprisingly private, villa with every home comfort. It is in a residencial area surrounded by other villas and apartments but not overlooked in anyway. It is exactly as described on the website. The heated pool made it very easy to get in any time of day or night. Well located for exploring the West of Cyprus and just a short walk to the many restaurants in Peyia. Very pleased you enjoyed your stay at our Villa. If you wish to return anytime please ask for our special 5% extra discount offer only available for returning guests. We thoroughly enjoyed our stay at Pilgrims. The villa is very comfortable and very well equipped. The pool is wonderful and so well looked after. It was lovely knowing the pool was there when we returned after a hot day out. We ate out a number of times at the restaurants in Peyia and the food was great and very reasonable. It is about a 30 minute walk up to the centre but the food made it worthwhile. Richard, the owner is very easy to deal with and provided us with comprehensive instructions and recommendations of places to visit or eat at. Overall a great holiday and would highly recommend Pilgrims for a quiet relaxing stay. This is our third stay at this beautifully located villa. The private pool and peaceful location make for a relaxing stay, there are many places to visit ranging from drinks at sunset a few minutes by car to boat trips and waterfalls travelling through beautiful scenery. We always have a fantastic break and come away feeling refreshed and recharged. The pool is very well maintained and the villa contains everything you need for a wonderfully relaxing stay. A box of delights in the sunshine. My wife and I stayed at Pilgrims for 2 weeks from 28 May 2015. We have stayed at many places in Cyprus over many years, including several just a few miles from Pilgrims, but for us Pilgrims is the best. It is spacious, very comfortable with a lovely garden and a large well maintained pool. My pre breakfast swims were followed by freshly squeezed juice from the garden's orange tree; you can't beat that. TV with multi channels and free wifi were a bonus, as were the fly screens, which not many villas have. It is ideally situated for getting to beaches as well as many fascinating historic sites. Nearby tavernas and restaurants are plentiful and very good. We are now most definitely Pilgrim converts. Many thanks, really pleased you enjoyed your stay and grateful for the valuable feedback. We loved our week at Pilgrims. It is well situated and well kept, spacious and has everything you could need for a family holiday. Our 5 and 3 year-old daughters didn't seem to notice that the pool was sometimes a bit on the cool side(!) and even the weather was kind to us for the autumn half term week. I believe that there are too many places to see in the world to go back to places on holiday, but I could make an exception for Pilgrims! Beach is about 5 mins in the car (20 mins to walk). We strongly recommend a car to take advantage of the many attractions Cyprus has to offer. For information about the location of our villa and the surrounding area please ask. You can fly to Paphos (40 mins) or Larnaca (2hrs) but we think you will find Paphos much more convenient. A hire car is strongly recommended for any location on Cyprus . Car hire from/to the airport is easy and convenient. We have a car at the villa which guests may use (additional charge) subject to driver eligibility and insurance. Our villa, we think, is in the perfect location to explore the island. 5 mins by car from beach, village, supermarkets etc, close to the large Akamas conservation area where the turtles breed. In an hour you can be in the ancient forested mountains, an hour and half to Nicosia and couple of hours into the Turkish North. An hour to the fabulous Roman ruins at Kourion - very extensive site including amphitheatre on top of the cliff overlooking the sea - it's spectacular! Wonderful roman archeaology and mosiacs just down the 'Tomb of the Kings' road in Kato Paphos . Restaurants in Peyia (15-20 min walk) are great and cheaper than Coral Bay more details available on request and at time of booking. We often prefer to walk to the beach or you can catch a bus at the bottom of the road but remember it is really HOT in summer. We usually walk up the hill to local restaurants, great food, people and atmosphere, and the 15min walk back downhill afterwards is good for the digestion and means we can have a carafe of wine with our meal - alternatively you can drive up, park in the large car park, walk back after your meal and pick the car up in the morning. Booking Notes: Please contact owner Changeover Day: Please contact owner Notes on prices: 10% DISCOUNT is offered for 2 person occupancy. Guests may arrive/depart any day of the week subject to availability.